Shopping for Kung Fu Panda Artwork? Show your respect for all things with Kung-Fu Panda! 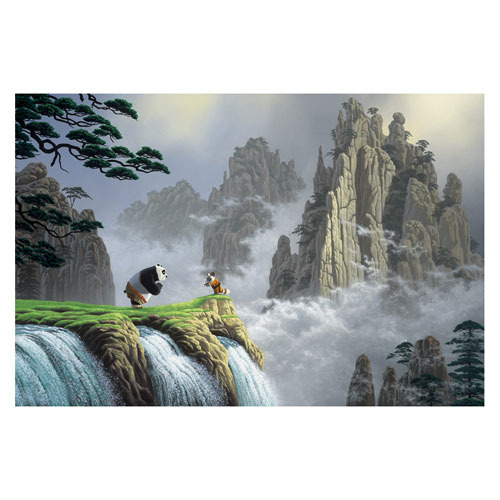 This Kung-Fu Panda Respect For All Things Large Canvas Giclee Print is a beautiful piece of artwork based on the Kung-Fu Panda series and displays Po bowing to Shifu at the top of a waterfall. A limited edition of just 25 pieces hand-numbered and signed by artist Schim Schimmel, it comes complete with certificate of authenticity and measures 30-inches wide x 20-inches tall!